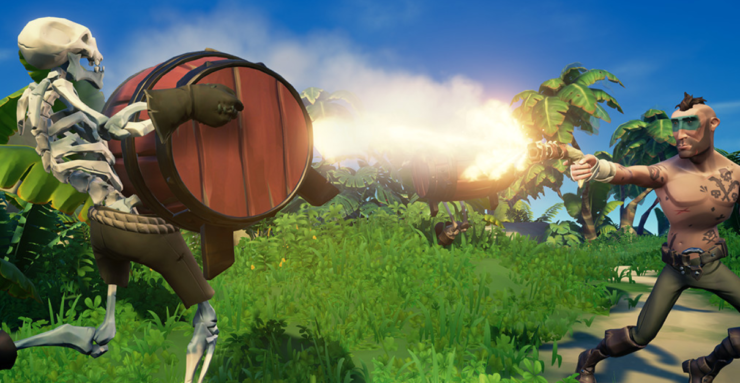 Microsoft and Rare have deployed Sea of Thieves patch 1.1.4 which introduces the second Bilge Rat adventure alongside key performance improvements, skeleton aim changes, and more. Gunpowder Skeletons Event – Carrying a gunpowder keg, skeletons can now rush towards you, light their fuse and… BOOM, off to the Ferry you go! The Bilge Rats are challenging all brave pirates to defeat them in various ways, some less conventional than others! Keep an ear perked for a burning fuse, and a finger on the trigger… good luck! Explosive Force – When detonated, gunpowder kegs now have the force to rock and push ships. Fuses – When holding a gunpowder keg, players can now light a five-second fuse by pressing the primary action button (Right Trigger on controller or left click on mouse). Legendary Commendations – Legendary Commendation to earn an additional 50 Doubloons! These Legendary Commendations have been added based on player feedback requesting replayability. Megalodon – Megalodon behaviours have been updated and improved. Skeleton Accuracy – Skeletons wielding a blunderbuss or pistol have had their accuracy reduced. This was tweaked due to player feedback. Joinable Status – Players can now make themselves unjoinable from the new Crew Management tab within Settings. This will mean that even friends can no longer join your session. Bilge Rat UI – The reputation summary and icon have been updated with improved visuals. We are currently rolling out a fix for this issue which will award missing rewards from The Hungering Deep. This will take some time, so keep an eye on the weekly patch notes to see when the rollout is complete. Sea of Thieves is available now for both Xbox One and Windows 10 PC.